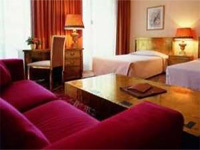 The Hotel de la Cigogne in Geneva is one of the best accommodations in the city... Luxury charming rooms and reputated Restaurant - A perfect choice for a romantic stay. Room rates have been negociated and are discounted up to 60%. A luxury 5 star hotel enjoying a nice location in the city center in the historical heart... This hotel is available to online reservation - Enjoy your stay in one of the most charming accommodation.